PALO ALTO, Calif.--(BUSINESS WIRE)--Currant, a startup devoted to creating smart products that reduce energy consumption, today announced the Currant Smart Outlet — the first smart outlet on the market powered by artificial intelligence (AI). This unique outlet and its connected app enable customers to view a breakdown of their power usage and receive personalized, easy-to-implement suggestions for taking control of their homes and their energy bills. The company also announced it has raised $7 million in seed funding. Americans spend approximately $19 billion every year, or about a quarter of the household electricity consumed in the US, on devices that are not actively being used.1 Currant addresses this problem by leveraging AI to help people discover the biggest energy offenders in their homes so that they can cut excess electricity usage without sacrificing comfort or convenience. Real-time electricity usage and intuitive graphs that display energy consumption and cost by hour, day, month, or year. Remote monitoring and control, so customers can ensure that devices and appliances are off whether they’re down the street or across the country. The highest safety ratings of any smart outlet. To get started, customers simply plug in the Currant Smart Outlet and connect to the app, available for iPhone and Android. The app automatically detects the outlet and displays real-time information on energy usage. Customers can opt to set outlet-specific rules right away to turn the power on and off according to their preference and schedules. Alternatively, they can use Currant as a normal outlet for a week, and it will deliver tailored suggestions based on the types of device utilized, the amount of energy consumed, and the individual’s unique usage patterns. For example, Currant may suggest a rule that eliminates idle power usage by turning a set-top box off when the TV is not on, saving as much as $30 per year with a single smart outlet. Designed by Bould Design, the studio responsible for the Nest Thermostat look and feel, the Currant Smart Outlet features a sleek, reflective surface, two independently-controlled outlets, and a plate that can switch directions to keep cords organized and out of the way. In addition to Granbery, who sold his previous company to PayPal, the Currant leadership team includes executives from Apple, Jawbone, PayPal and Flextronics. The company has raised $7 million in funding. Uncork Capital and K9 Ventures, two investment firms with established track records of investing in hardware companies, led the funding across two rounds. UP2398, Precursor Ventures, and a consortium of investors in the construction industry also participated. Currant creates smart home products that give people control over their homes — and their energy bills. Coupling the latest technology with advanced AI capabilities, Currant makes it easy to view, analyze, and understand electricity usage, empowering consumers to change wasteful patterns without sacrificing comfort or convenience. 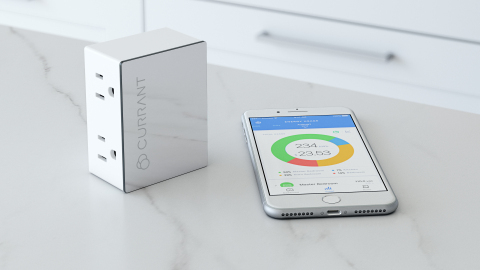 CEO Hasty Granbery founded Currant in 2015 after he discovered that his toaster used more energy each day when it was idle than when it was making toast, and wanted a way to easily see how everything else in his house was affecting his energy bill. The company is based in Palo Alto, California.